Abdur Razzaque was a distinguished student of the second batch of the Government Institute of Art who played a pioneering role in the development of the modern style of painting in Bangladesh. Razzaque was born in 1932 in a remote village in Shariatpur, Bangladesh. He graduated from the Institute of Fine Arts in 1954. A Fulbright scholar, he pursued post graduate studies at the State University of Iowa, USA, and worked under the renowned printmaker Mauricio Lasansky. Razzaque was the first Bangladeshi to have earned a masters degree in Fine Arts. 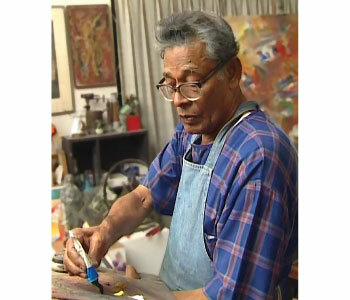 Proficient in graphics, sculpture and painting, Razzaque is especially remembered for his role in establishing the Department of Sculpture in the Government Institute of Art. His works have been exhibited in many countries of the world. Abdur Razzaque received the Ekushey Padak in 1987. A 72-page brochure, 24-page folio and the film Garaner Gahine have been published by Bengal Foundation to mark a retrospective of Abdur Razzaque’s works held at the Bengal Gallery of Fine Arts in October 2008. Copyright © 2019 Bengal Foundation. All rights reserved.